The seed of the cilantro plant is known as coriander. The name coriander is believed to have been derived from Koros, a Greek word which means insect or bug due to its strong bug-like smell. Though its origin is not known, coriander is said to be native to Southern Europe and China. Its seeds have been found in the tombs from the 21st Egyptian Dynasty, over 3000 years ago. In Chinese mythology, it was believed that coriander had the power to grant immortality. 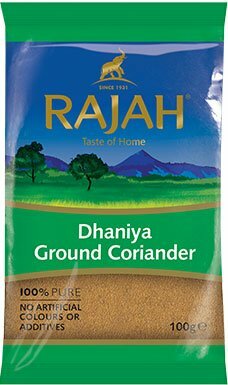 In India, coriander is commonly known as dhaniya and is cultivated in Rajasthan, Madhya Pradesh, Uttar Pradesh and southern states like Andhra Pradesh. Being a tropical crop, coriander plants require a well lit area with well drained soil. It doesn’t do well in high humidity and damp conditions and should not be planted next to fennel as this will kill both plants. Loamy soil is best suited for commercial cultivation of coriander where the crop is raised as an irrigated crop. Otherwise, coriander can be successfully grown in black soils where it is raised as a rain fed crop. Coriander seeds are harvested when about half the seeds turn yellow and these are then dried under the shade in order to retain the seed’s colour and quality. After drying, seeds are separated by light beating with sticks and winnowing. Most people do not know that all parts of the plant are edible, but the fresh leaves and the dried seeds are the parts traditionally used in cooking. The best way to get maximum flavour out of coriander seeds is to dry-fry them. 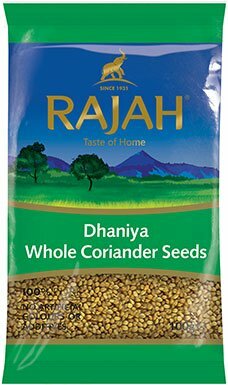 When storing the coriander seeds, place them in an airtight container, kept in a cool, dark area, away from direct heat or sunlight. To test whether the seeds are still potent simply rub or crush a small amount in your hand and then taste and smell them. If the aroma is weak and the flavour is not obvious then the seeds should be replaced. Coriander is used for digestion problems including upset stomach, loss of appetite, hernia, diarrhoea, bowel spasms, and intestinal gas. It also helps with treating measles, haemorrhoids, toothaches, worms, and joint pain, as well as infections caused by bacteria and fungus. Coriander is currently used in modern medicine as a flavour enhancer.